tags: A second coming of panic! 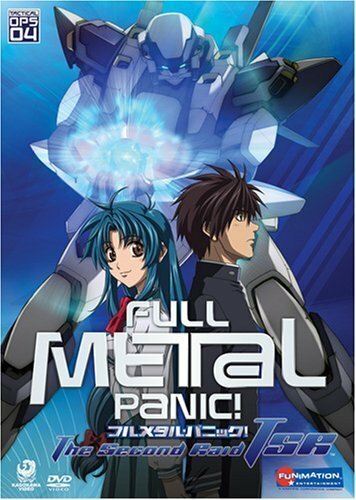 This is the sequel to the first Full Metal Panic! series and starts where the first series left off. 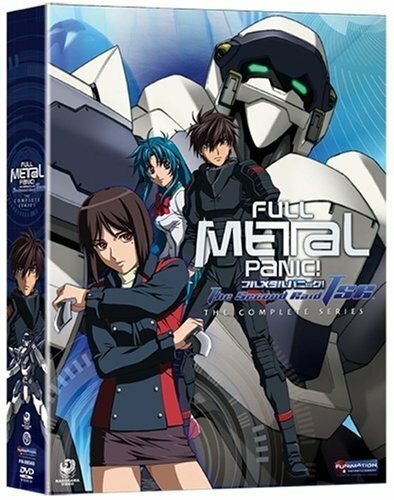 Sousuke is back and is having a hard time mixing school and his military job, but things are not going to be easy for Sagara and his friends, because a secret organization wants to eliminate Mithril and carry on their evil plans. I've got to say, what I've seen of Fumoffu was a bit plot-light, and even the first series had its duller moments, but at thirteen episodes TSR packs so much in! Expect to see more action, faster AS battles, scarier bad guys (seriously... Gates has *issues*). Unfortunately for fans of Fumoffu, neither Hayashimizu nor Ren Mikihara have speaking parts in this series, although Ren can be seen briefly in one scene. Much of the story takes place aboard TDD-1, and that means more Kurz and Mao, and even a little background on Tessa's family! Anyway, wicked plot, great pacing, good character expo, awesome character development, particularly for Souske. Spectacular animation. The background music won't survive more that one or two listens out of context, but the energetic and heartfelt 'Minamikaze' (South Wind) of the title theme is excellent, and the slower closing theme has plenty of fans. Look forward to this!